We are all aware of Abebe Bikila, who won the 1960 Olympic Marathon running barefoot. And I’ve introduced you to Bruce Tulloh, who won a 6-miler at the British games in 1962 barefoot, and the gold running the 5000m the at the European Championships. Here is another barefoot winner from the 1960s. His name is Dale Story, and he ran for Oregon State. He held the high school one-miler record at 4:11.0 (though he did that shod). His big success was winning NCAA cross-country team championships in November 1961, barefoot. The meet was held at Michigan State University . . . in November. According to the story (the Story story), it was a snowy course with the temperature right around freezing. I guess it didn’t bother him. 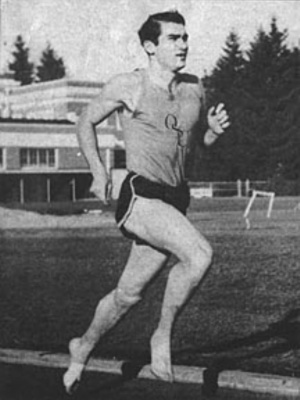 He also won the May 1962 West Coast Relays (do I need to add again that he did so barefoot) in the 5000 meter run, and set a new national collegiate record of 14:03.5. Finally, at this link, you can watch an interview with him at an Oregon State ribbon-cutting ceremony in 2012 for their new Whyte Track & Field Center. Unfortunately, they didn’t ask him at all about his barefoot running. It has been 50 years since former Matie athlete De Villiers Lamprecht on November 13, 1964 became the first South African to run a dream Mile, 1609 meters, in under 4 minutes, clocking 3:59.7. He accomplished this remarkable feat 10 years after British athlete, Roger Bannister, ran the first dream Mile in the world. 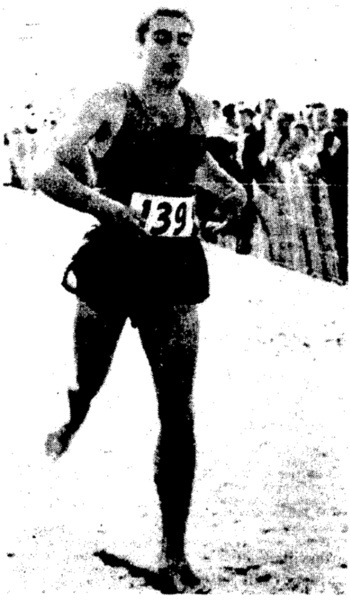 Lamprecht, who was also the first athlete in the world to run a sub-4 minute Mile barefoot, would break the magical 4 minute barrier five times (and the 16th man overall).